Here is an all you need to know guide to Google Search Ads. For those new to digital marketing and advertising, you are on the right page. Google as a corporation very rarely restricts its userbase, and Google has made available various different options in terms of customization to suit the needs of its users. One such service made available is Google Search Ads. Let’s start off by giving you a brief idea of what Google Ads are. What is (are?) Google Ads? Google Ads were introduced in the year 2000 and ever since its inception it had taken digital online marketing to a new realm. If the term ‘Google Ads’ sounds foreign to you, this is because Google decided to rename Google AdWords as ‘Google Ads’ back in June of 2018. Google Ads is an online advertising platform (developed by Google of course). Companies and businesses can display brief advertisements in various forms. How Do Google Search Ads Work? Google Search Ads is a method of placing online advertisements on web pages that show results from search engine queries. Search Ads use targeted keywords for specific customers. Customers often use this option to choose from the various ads that pull up on entering keywords of the products and services they are looking for. This simplifies the whole process for the customer but does put your company in a bit of a completion. How Are Search Ads Measured? CPC stands for ‘Cost Per Click’. CPC is the amount of money a business is charged for each time someone clicks on the Search Ad. It is also known as ‘Pay Per Click’ (PPC), where the advertiser pays a fee for each click the ad gets. This is the most popular method of advertising. CPM means ‘Cost Per Mille’ and CPT is ‘Cost Per Thousand. It is the cost paid per thousand views or impressions. This means that a sum of money is paid to Google for every 1000 users that view the ad. CPM and CPT are the most commonly used methods to calculate advertising when it comes to views. CPA is ‘Cost Per Action’ or ‘Cost Per Acquisition’. The CPA is the fee paid for the completion of a specific task such as making a sale. They are commonly used by e-commerce companies such as Amazon or Walmart. CPC, CPM, and CPA are the three payment methods when it comes to Google Ads. CTR means ‘Click-Through Rate’ or ‘Click-Through Ratio’. This is the number of times an advertisement is clicked as a rate of views is the web page on which the advertisement shows up. It shows how many people clicked on your ad and went through to your page as a percentage of total viewers. Let’s make this simple. CTR is calculated as Clicks divided by Impressions. If your ad got 50 impressions and 2 clicks, then the CTR would be 2/50 which is 4%. For reference, the average CTR for Google Search Ads is just 2%. In hindsight, getting 2 clicks out of 50 isn’t too bad, is it? If you are in the initial stages of your business and looking at directing customers to your website, Google Search Ads is the solution for you. Google Search Ads are all about keywords. Choose the right keywords and in no time, all you need to market your business is Google Search Ads. What Are Some Tips & Tricks for Google Search Ads? Here are some tips and tricks to have Google Search Ads work efficiently for your business. Estimate the budget your business will invest in Search Ads and the number of the target audience you wish to advertise to. The only thing that doesn’t change is change itself. Monitor the progress of your ads based on the chosen keywords. Make changes in the keywords based on the number of visits within a given period. You also need to do constant research and keep improving. After doing all the work and drawing the visitor in, you don’t want them to be disappointed with the landing page they end up at. This means all the previous work of getting a click to your website was in vain. Design a great landing page and make it as appealing as all the previous factors that got the audience to choose your page. Let the above information be a key in your first steps of advertising your business via Google Search Ads. Use Google Search Ads Now! If your business is yet to be advertised through the innovative and economic means of Google Search Ads, then it is high time you do so. 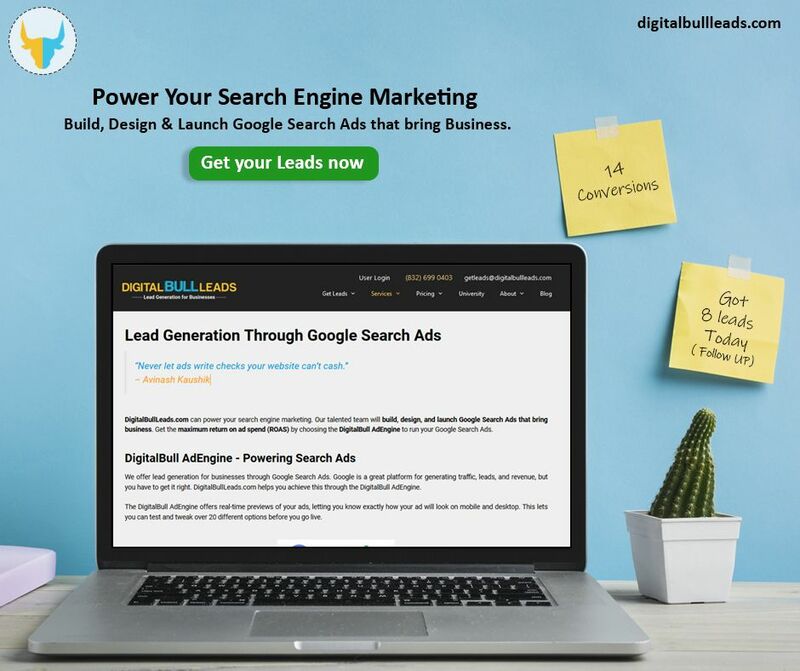 With the above description and the detailed breaking down of the features and benefits of Google Search Ads from our DigitalBullLeads.com team, the thought of getting your products and services on board should have crossed your mind minutes ago. So, stop waiting around and depending on traditional methods of marketing. This Christmas and holiday season, you need to run effective Google Search Ad campaigns. This allows you to transform your business into an empire, then allow technology to take over and do its thing, and have your company reach soaring heights.